Jen's Ink Spot: Save $$ on Online Christmas Shopping? YES! Save $$ on Online Christmas Shopping? YES! From time to time I come across money saving programs that I just can't help but share! This is one! I have found myself doing more and more of my holiday shopping online through the years. And I love to save money. I don't check out from any store until I have done everything I can to find as many coupon codes, etc to make my purchase as low as it can be. I joined Ebates almost a year ago and I wish I would have joined sooner! I LOVE getting those checks/paypal credits (you choose!) in my account! Crafters do you like saving even more at Michaels, Joanns & Amazon to name a few? Moms do you like saving at Kohls, Target, Walmart, JcPenneys, Amazon, etc? There are over 1,700 stores to choose from! Then THIS is a program you'll want to check into! Ebates is the pioneer and leader of online cash back shopping. Ebates pays members cash back every time they shop online as well as provide them with the best coupons and deals online. Founded in 1998, Ebates Inc.'s websites have paid over $325 million in cash to its members. That's why millions of people have joined Ebates, and we're excited you are ready to start earning cash back, too. Each store offers a different cash back percentage. Just look at the percentage next to the store name on the Ebates.com site to see how much savings you will earn. Seriously! That is ALL there is to it! Each store has a different % that you get in cash back. For example, I shopped at Kohls.com this week and earned 8% cash back. Today it is 3% cash back, so the % changes regularly. 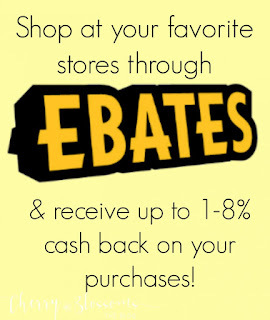 Ebates also has at least one store every day that you get double cash back from for purchases. And they also find coupons for each of their stores and post them on their site as well! I have the Ebates site bookmarked on my toolbar and when I want to shop online I click on that site first, find the store I am shopping at and it takes me to that site. I shop just like usual and then at the end of the transaction (or when the payment is charged) that store sends the info to Ebates and they apply the credit to your account. You can also add a button to your browser toolbar that will alert you when you can get cash back if you forget to click on ebates first. Once you have at least $5.01 in your account you will get a payment. They pay every 3 months (although it seems more often than that) and you can choose to be paid via check, paypal or you can even designate a charity for it to go to! I would love if you would sign up via my referral link, because then we both get a bonus! (And I promise you that this is legit and a GREAT DEAL!!) You can click on the button on the right hand side of my toolbar or click on this link here: CLICK TO START SAVING MORE! Lil' Inker Black Friday Sale Ends Tonight!